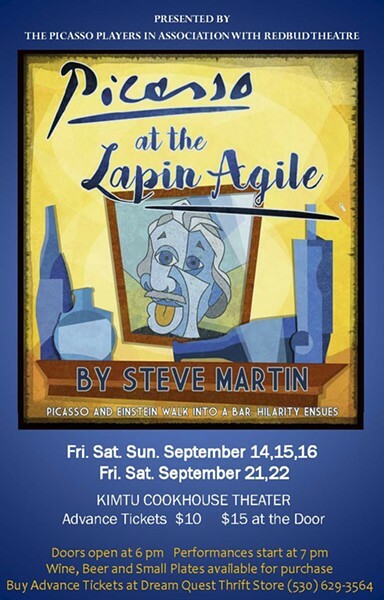 Picasso and Einstein Walk In to a Bar… The Picasso Players, working in association with Redbud Theatre, is bringing Steve Martin’s Picasso at the Lapine Agile to Willow Creek’s Kimtu Cookhouse Theater. This long running Off Broadway absurdist comedy places Albert Einstein and Pablo Picasso in a Parisian Café in 1904. This is before the Einstein transformed physics with his theory of relativity and Picasso set the art world afire with cubism. Steve Martin plays fast and loose with fact, fame and fortune as these two geniuses muse on the century’s achievements, prospects, and other fanciful topics.